A visit to the Open Air Theatre in the middle of July. It seemed like a brilliant idea at the time of booking – a lovely summer evening and maybe a picnic before the show. In the end I spend about 3/4 of the performance sitting in the pouring rain (my wallet took 2 days to dry completely!). But that’s the risk with performance spaces like Regent’s Park Open Air Theatre. I’ll just call this a challenge completed because yes, I did sit through the whole performance despite the weather. This production has quite a modern feel to it with the big banner of President Obama in the background of the stage. I’m not too convinced by the set I have to admit. It looks a lot like a random garbage dump and reminds me of a set one would use for Cats. There’s a piano on one side of the stage where the house of Mother and her family is set and various scenes take place on a slight elevation on the left side of the stage. I know a set doesn’t have to be detailed or naturalistic but I just didn’t see the point in letting the characters walk around in a dump. That might be just my lack of understanding for a new and modern approach to this show though. The cast is the real stand out in this production (with few exceptions). First of all there is the wonderful Rosalie Craig as Mother. She is without a doubt the star of the show and brings such a warmth to her character that is it impossible not to be impressed by her performance. Plus her voice is nothing but beautiful and suits the songs perfectly. Rolan Bell plays Coalhouse Walker (father of Sarah’s child and leader of the black group). He seems to struggle with the songs now and then and in my opinion his portrayal of the character is slightly too angry and imature which makes it hard to be on his side no matter what injustice he experiences. 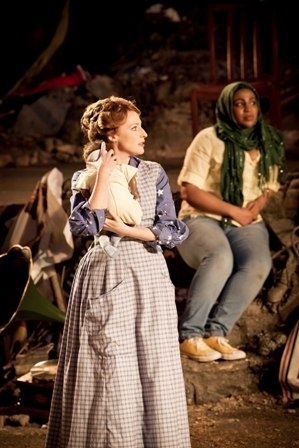 Claudia Kariuki on the other hand brings a tear to the audience’s eye with her moving portrayal of Sarah, the black woman who first abandons her newborn child and is then invited to stay with Mother and her family. John Marquez plays Tateh, the Jewish immigrant who comes to America with his little daughter in search for a better life, with a twinkle in the eye while never losing sight of the struggle the character goes through. David Birrell gives a fabulous performance as Father and manages to give the audience a great insight into the inner turmoil of the character. His singing is spot on and I particularly enjoyed seeing him and Rosalie act together. Both Harry Hepple and Jo Servi do a good job as Brother and Grandfather. I would have loved to hear Harry sing more as I loved his voice when I saw him in Pippin at the Menier Chocolate Factory. I would like to give a special mention to Stephane Anelli (Harry Houdini) who never fails to make me smile with his amazing dancing and his great facial expressions (which can be hilarious if the part allows a funny interpretation). Special kudos for dancing like this on a wet and slippery stage and for performing those Houdini tricks (or rather stunts!) in the rain. My one major criticism regarding the casting is the mixing up of gender and race. I have nothing against colour-blind casting, don’t get me wrong! But having a black guy play the white grandfather and a woman the male Booker T Washington just makes this already quite complicated piece even harder to understand. If Ragtime was a well-known musical it probably wouldn’t matter but most visitors will most likely never have seen the show and the different storylines are difficult enough to follow without adding cross-race and cross-gender casting. 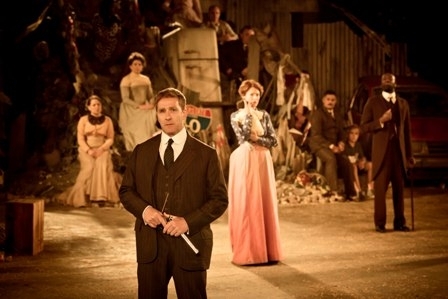 As the title of the show suggests the score is very much influenced by the ragtime era so it has a jazzy and partly gospel feel to it and makes good use of the piano. The title song “Ragtime” is definitely a catchy tune and big ensemble numbers like “Till we reach that day” are quite spectacular to listen to. I probably wouldn’t listen to a lot of the songs at home but I really enjoyed them in context with the story. Ragtime is certainly not an easy musical and I highly doubt it will please theatregoers that are focused on feel-good shows and who want to spent a relaxing evening at the theatre without having to think too hard (and there’s nothing wrong with that, I do it as well to get away from the busy and hectic everyday life now and then). However, if you want to see a show that intertwines history and fiction to tell a story of personal drama, change and everyday problems of people in America in the early 20th century this is the piece for you. 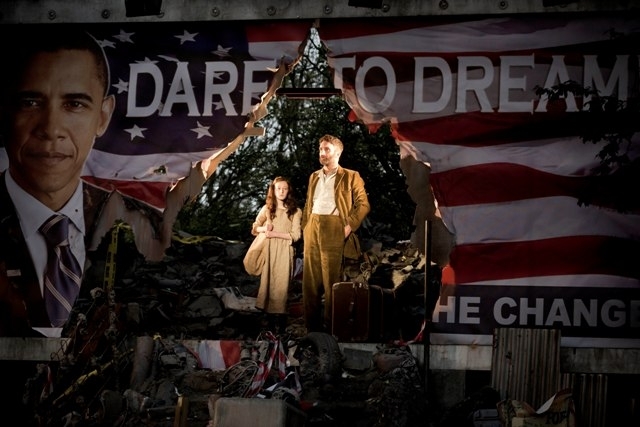 This production is by no means perfect but the stellar cast alone is worth braving the British “summer” and spending an evening at the Open Air Theatre. 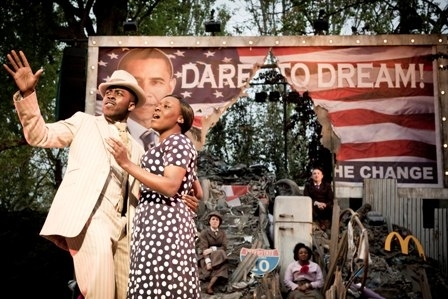 Ragtime is showing at Regent’s Park Open Air Theatre until September 8th. For more info and to book tickets go to http://www.openairtheatre.com/production/ragtime-the-musical.